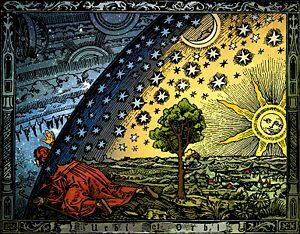 Colorized version of the Flammarion woodcut. The original was published in Paris in 1888. Pantheism states that God spans the entire universe but can also be found outside of it. The term panentheism (meaning "all-in-God") was coined by German idealist philosopher Karl Christian Friedrich Krause (1781-1832), in the process of replacing scholarly notions of the transcendent God with a more participatory notion of the divine. Derived from the Greek words pan (all), en (in) and theos (God), this term refers to the belief that the world is in God, who in turn is in the world. Panentheism, however, is meant to be different from pantheism, which ontologically equates the universe with God. Thus, the panentheistic God is both an immanent force within all creation, and the transcendent power over the universe. There are two types of panentheism: 1) the type of panentheism that is partially pantheistic, claiming that the entirety of the universe is contained within God as a part of God, who is, of course, more than the universe that is only a part of God; and 2) the kind of panentheism that sees the ontological distinction between the world and God, when saying that both are immanent in each other. The second one may not be totally alien in the Judeo-Christian tradition. Panentheism has not yet been embraced by a large amount of major religious and theological groups, although it has been recognized experientially in most historical religions. But, it is gaining momentum among contemporary theologians and philosophers of religion, serving as an acceptable means for reconciling difficulties with other beliefs concerning the nature of God. Panentheism is typically viewed as a theological and philosophical middle ground between strict monotheism and pantheism (not "pan-en-theism"). For the strict monotheist, God and the world are separate, with God usually seen as completely transcendent (above and beyond the world). For the pantheist, in contrast, God is identified with the universe as a whole, and is seen as being immanent within the world rather than transcending it. Panentheism seems to reflect a philosophical urge to balance transcendent and immanent properties of the divine by preserving aspects of God's transcendent self-identity while also promoting a deep sense of intimacy between God and the universe. In panentheism, therefore, God, while being very immanent, is transcendent also as both the creator and the original source of universal morality. However, there seem to be two distinguishable types of panentheism. According to the first type, the universe is contained within God as "a part of" God. In this case, the universe is considered to be of the same ontological substrate as God, and this is how God is immanent. As for God's transcendence, it is taken to mean that he is simply more than the universe that is only a part of God. This type of panentheism, which is, in fact, partially pantheistic, creates a challenge to theism, but is still quite popular. Less challenging than this is the second type, which does not consider the universe to be of the same ontological substrate as God but rather regards the universe and God as two distinct realms, while at the same time saying that the universe is in God, and that God is in the universe. The three varieties of panentheism mentioned by Neils Gregersen, for example, belong to the second type, and they are: 1) "soteriological" panentheism, which asserts that the world's being in God is attained as the eschatological consummation of creation through the salvific grace of God; 2) Hegelian "expressivist" panentheism, which holds that "the divine Spirit expresses itself in the world by going out of God and returning to God"; and 3) Whiteheadian "dipolar" panentheism, which believes that God and the world, being distinct from each other, nevertheless feel each other through the universal dipolarity of transcendence and immanence. Plato's writings address the philosophical quandaries caused by the immanent and transcendent aspects often attributed to God. In Timaeus, Plato's account of creation, he recognizes an absolute and eternal God who existed in perfection without change, a marked contrast to the highly malleable world of forms. Along with this God existed a World-Soul, which contained the world and animated the various processes therein, existing as the most divine of the worldly things in a state of flux. Plato claims "that the world resembles more closely than anything else that Living Thing of which all other living things are parts. Panentheists since the time of Plato have typically interpreted these ideas to imply that Plato perceived a duality within the divine, which served to unite the absolute with the relative. The separation of these categories into separate deities seems to have dissatisfied Plato in his later works. In Book Ten of The Laws, therefore, he uses the analogy of circular motion, combining the notion of change on the periphery with the constancy of a fixed center, in order to illustrate the action of one God. While one aspect of God toils immanently within the world of change (like the circumference of the spinning object), another remains constant and unwavering in a state of transcendence (like the fixed center). He supplements this analogy with the conclusion: "We must not suppose that God, who is supremely wise, and willing and able to superintend the world, looks to major matters [such as creation of the universe] ... but neglects the minor." Thus, Plato's later conceptions of God seem to insist that God is both transcendent and immanent, and could be considered prototypical of panentheism, although it remains somewhat unclear whether God's immanent side and the world are pantheistically identical. Although early Vedic Hinduism is largely considered to be polytheistic, seeds of panentheism can be identified within the text. One example involves the myth of Purusha found in Book 10 of Rig Veda. Purusha, the cosmic being, is sacrificed by the gods in order to supply from his body the material by which all things in the world can arise. Thus, the ground of all material objects lies in this cosmic self. While this can be interpreted as pantheistic, the fact that a larger body of gods committed the sacrifice of this cosmic man suggests that there is a higher divinity beyond the universe in which humanity exists. Further, this godly existence of Purusha seems to pre-exist before the actual physical world, suggesting that the divinity of God is in some way a transcendent precursor to the world that God will later sustain. With this consideration, panentheistic themes can be identified in early Vedic Hinduism. Later on, with the development of the concept of Brahman (the supreme cosmic spirit which is regarded to be eternal, genderless, omnipotent, omniscient, and omnipresent) in the Upanishads, panentheistic notions became more frequent among Hindu thinkers. Although it is commonly described as subsuming all being, Brahman is also described as the embodiment of non-being as well. While such a description is more than somewhat nebulous, it could be interpreted to mean that Brahman also transcends the physical universe and represents a realm inconceivable to humanity, beyond the physical realm of "being." Thus, interpreted in this fashion, the conception of Brahman becomes decidedly panentheistic. Even the deeply personal view of divinity propounded in the Bhagavad Gita, the most popular religious text in Hinduism, contains elements of panentheism. In the Bhagavad Gita personal and loving elements of God are unraveled for the reader as the divine Lord Krishna pilots young warrior Arjuna's chariot into battle. Panentheism seems evident within this formulation of God as well, in various lines of the poem such as Krishna's delineation of his immense heavenly prowess: "With a single fragment of Myself I pervade and support this entire universe." This seems to suggest that God (Krishna) contains the universe in which he is currently present and more, a definite variation of panentheism. It is safe to say that Hinduism in general, while being panentheistic as is clear from above, has a pantheistic overlapping between the world and some part of the divine. Although Sikhism is conventionally described as a form of monotheism, some aspects of its theology can be considered panentheistic. Sikhs believe in one transcendent creator who exists independent of the world. Yet, this God also manifests on the worldly plane, solely preserving the whole of existence. Therefore, the Sikh conception of God spans both absolute and relative realms, much like the panentheistic notion of deity. Famous figures throughout the history of Sikhism have also espoused similar notions, including none other than Guru Nanak himself, the founder of Sikhism in the sixteenth century. In one story, it is said the Nanak traveled to Mecca whereupon he stopped to rest; he lay down, accidentally pointing his feet in the direction of the Kaaba sacred shrine. He was promptly chastised for this action, which was seen as an insult to Allah. Legend has it that Nanak replied to his critics by saying, "In what direction should I point my feet so they will not face God?" Such a story bolsters the Sikh notion that God's presence is found everywhere in the physical world, which in concert with God’s transcendence furthers the notion that Sikh theology is panentheistic. When Hasidic Orthodox Judaism first developed as a movement, its theology was somewhat panentheistic. Some early Hasidic texts seemed to uphold the claim that God permeates all physical objects including living beings. For example, some put forth the idea that God is present within natural forces. Many Jewish traditionalists in opposition to the Hasidic movement viewed these writings literally, and considered this seemingly panentheistic understanding of God as an aberration to their religious faith. However, panentheistic interpretations of the aforementioned variety within Hasidism were not common, as most Hasidic Rabbis concluded that within the physical universe, God is only the animating force and nothing else. Although rejected by Orthodoxy, panentheistic descriptions of God have become more and more common in the Conservative, Reform, and Reconstructionist branches of Judaism today. While mainstream Christianity is considered to be monotheistic, there are also some Christian groups who emphasize the panentheistic dimension of God. For example, the Eastern Orthodox Church now uses the word "panentheism" to describe the personal activity of God, or hypostasis, in the world. For the Orthodox, God is not a detached creator (as in deism), nor is he the "magician" who occasionally performs miracles, as in many conceptions of theism. Instead, God's presence is considered necessary not only for the initial creation, but also for the continued existence of every aspect of that creation. God's energies maintain all things, even if those beings have explicitly rejected God, as withdrawal of God's presence would usurp the totality of existence. By this token, the entirety of creation is sanctified, and thus evil is denied as a property of creation. This conception is panentheistic, although it has an ontological cleavage between God and creation, as is standard in Christianity. The world is embedded in God's will but not God’s essence (ousia). Creation, then, is not a "part of" God as it would be in other panentheistic systems, and the Godhead is still distinct from creation. However, God is "within" all creation on a relational and personal level rather than an ontological one. Thus Orthodox theologians separate the word as "pan-entheism," stressing God's indwelling in all things, rather than "panen-theism," which focuses on the idea that all things are a part of God, yet God is more than the sum of all things. Process theology, a contemporary Christian theological movement that arose from the writings of mathematician Alfred North Whitehead (1861-1947) often utilizes panentheistic notions. Whitehead asserted that God has two natures, "primordial" and "consequent." Within these natures is contained the complete history of the world as well as all possible futures. Thus, at any given moment, an entity can be said to be contained within God, and as such it can be claimed that God is also present within that entity. Process theologians interpret this to mean that God contains the universe, yet is not identical with it. This God is immanent within human lives, providing a power of persuasion over human will rather than explicit force. Thus, humans still have free will rather than being at the mercy of God's coercion. Furthermore, because God contains a universe that is in a constant state of flux, God is also considered to be changeable, affected by the actions that take place in the universe over the course of time. However, the abstract elements of God, such as benevolence, wisdom, and so forth, remain constant. Thus, God contains and is immanent within the universe; however, the abstract elements he maintains represent his ultimate transcendence. Hence, process theology is essentially panentheistic. Panentheism, of any of the two types mentioned above, is considered to allow for the resolution of the philosophical difficulties inherent in the closely related doctrine of pantheism. For example, some claim that pantheism's conception of a completely immanent God mitigates the sense of power attributed to a God conceived as more transcendent. In panentheism, although God is, of course, always present in the immanent world, he also possesses all the transcendence of the traditional theist conceptions of God. Thus, not only does panentheism address these philosophical issues, but also it bridges the gap between theism and pantheism. Further, panentheists feel that their philosophical outlook affirms the freedom of humanity in a way that neither theism or pantheism can. While theism denies the pantheistic equation of the world with God and pantheism could be seen as a denial of the existence of individual choice apart from God, panentheists believe that their viewpoint provides an all-encompassing and fully perfected God, while at the same affirming the reality of individuals and their ability to choose freely within God. The panentheistic notion of freedom leads to a unique way of treating the problem of evil. While theism tends to attribute evil only to the world and pantheism is inclined to identify evil in the world as God's evil, panentheism takes a midway position, saying that while evil that occurs through freedom in the world has no effect on God's essence, God can still feel and experience it deeply. This midway position may crumble in case of the panentheism of the first type, however, because it is partially pantheistic, leaning toward the idea that evil in the world is within God. Although panentheism bridges the philosophical gap between theism and pantheism, it has not been embraced by a large amount of major religious and theological groups, instead persisting in small sects or else in personal philosophies. This is perhaps due to panentheism's highly abstract nature. Regardless, elements of panentheism arise in virtually every religious system whenever a given deity is described as both wholly powerful but also deeply imbued in worldly existence. This pair of divine transcendence and immanence seen virtually every religion is more expressly referred to as God's "two-sidedness" by the Dutch Reformed theologian Hendrikus Berkhof and "dipolar theism" in process theology. With that said, it should be noted that panentheism, especially of the second type, is gaining momentum among contemporary theologians and philosophers of religion, serving as an acceptable means for reconciling difficulties with other beliefs concerning the nature of God. ↑ The Global Oneness Commitment, "Pantheism—Related Concepts." Retrieved July 11, 2008. ↑ Neils H. Gregersen, "Three Varieties of Panentheism," in In Whom We Live and Move and Have Our Being: Panentheistic Reflections on God's Presence in a Scientific World, ed. Philip Clayton and Arthur Peacocke (Grand Rapids: William B. Eerdmans Publishing Co., 2004), 19-35. ↑ Plato, Timaeus, trans. Donald J. Zeyl (Indianapolis: Hackett Publishing Company, 2000), 31. ↑ Plato, The Laws, trans. Trevor J. Saunders (Toronto: Penguin Publishers, 1970), 436. ↑ Rig Veda, Book 10, Hymn XC. Retrieved July 8, 2008. ↑ Bhagavad Gita 10.42. Retrieved June 27, 2008. ↑ David Ray Griffin, "Panentheism: A Postmodern Revelation," in In Whom We Live and Move and Have Our Being: Panentheistic Reflections on God’s Presence in a Scientific World, ed. Philip Clayton and Arthur Peacocke (Grand Rapids: William B. Eerdsman Publishing Co., 2004), 46. ↑ Hendrikus Berkhof. Christian Faith: An Introduction to the Study of the Faith, revised ed., trans. Sierd Woudstra (Grand Rapids, MI: William B. Eerdmans Publishing Co., 1986), 114. ↑ John B. Cobb, Jr. and David Ray Griffin. Process Theology: An Introductory Exposition. (Westminster John Knox Press, 1977), 47. Bolle, Kees W. The Bhagavadgita: A New Translation. Los Angeles: University of California Press, 1979. This page was last modified on 12 January 2019, at 17:20.